IndianOil Tamil Nadu State Office conducted GST Outreach Programme for Oil Industry Stakeholders at IndianOil Bhavan, Chennai. 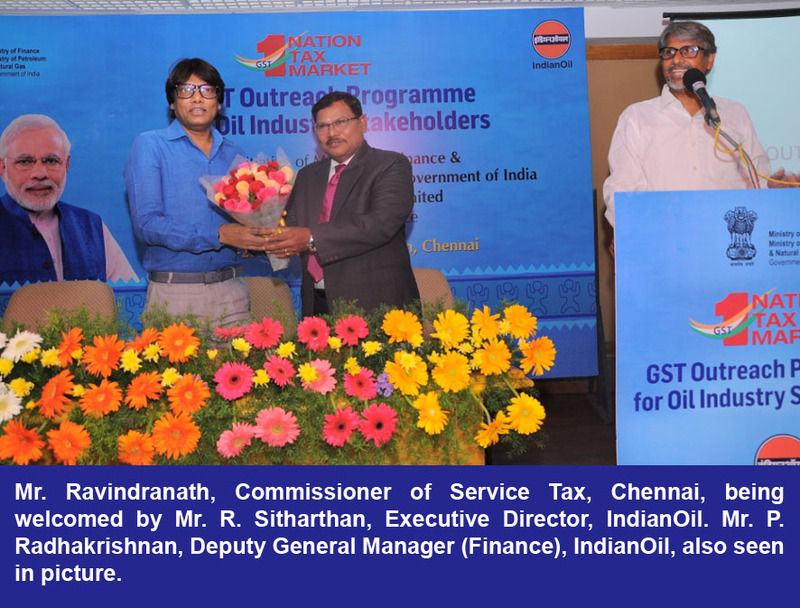 Mr. Ravindranath, Commissioner of Service Tax, Chennai, addressed a gathering of more than 200 vendors in the presence of Mr. R. Sitharthan, Executive Director, Tamil Nadu and Puducherry, IndianOil, and Mr. P. Radhakrishnan, Deputy General Manager (Finance), IndianOil. “Whether GST would be implemented or not is not a question anymore. I can authoritatively state that GST has been implemented and it has started working! !”, were the opening remarks of Mr. Ravindranth. Mr. Ravindranath spotlighted the genesis of GST and its basic principles. He briefed about registration criteria and modus operandi of registrations. He also pointed out the nuances of taxation, returns and input tax credit and time frame set for it. Discussions were held on Reverse Charge mechanism. During his address, Mr. Sitharthan said: “Seamless credit is definitely going to hasten and have a positive impact on business decisions. Removal of CST barriers on interstate movement goods would hugely benefit the corporate and commercial sectors”. Questions from vendor participants, regarding works contract, import of goods, composite supplies, and composition scheme were replied to.